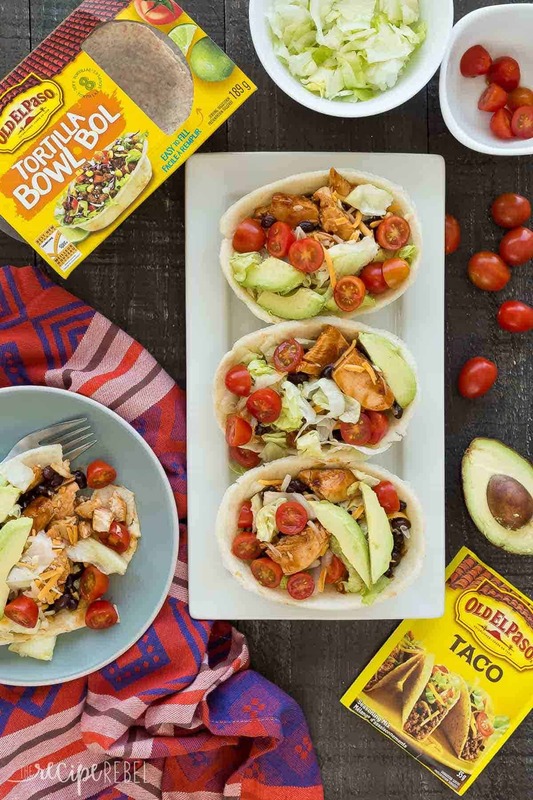 These BBQ Chicken Taco Bowls are an easy make ahead meal — freezer friendly and perfect for your week’s meal prep! The chicken can be made on the stovetop, in the slow cooker or Instant Pot. Includes step by step recipe video. I am SO excited about this post, friends. When I started thinking about what to make for Cinco de Mayo (it’s coming soon! ), so many possibilities came to mind. We could do tacos, or taco bowls. Or baked tacos. Or burrito bowls. I want to make them freezer friendly and make-ahead-able. The chicken…. I could do it on the stovetop, but isn’t that a little boring? 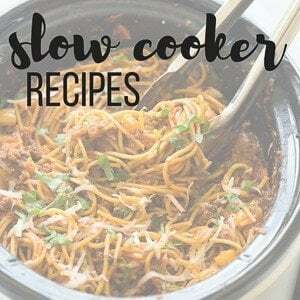 How about the slow cooker? 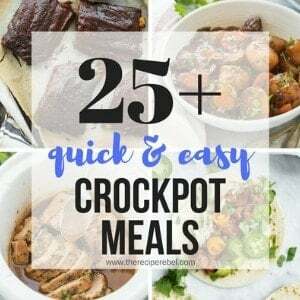 Instant Pot? All of the above?? The husband and I have been on a taco kick for about the last year, and I have been on a freezer meal kick since the beginning of time. I love love loooooove having extra meals ready to go in the freezer. It takes so much stress out of the stressful days (<— I said it. I have them), and it makes me appear to be somewhat sane, some of the time. Honestly, it’s a toss up whether we prefer these as tacos or taco bowls — the tacos obviously can’t be made ahead of time but they’re such a great option if you’re serving them at a party (maybe a little Cinco de Mayo shindig??). 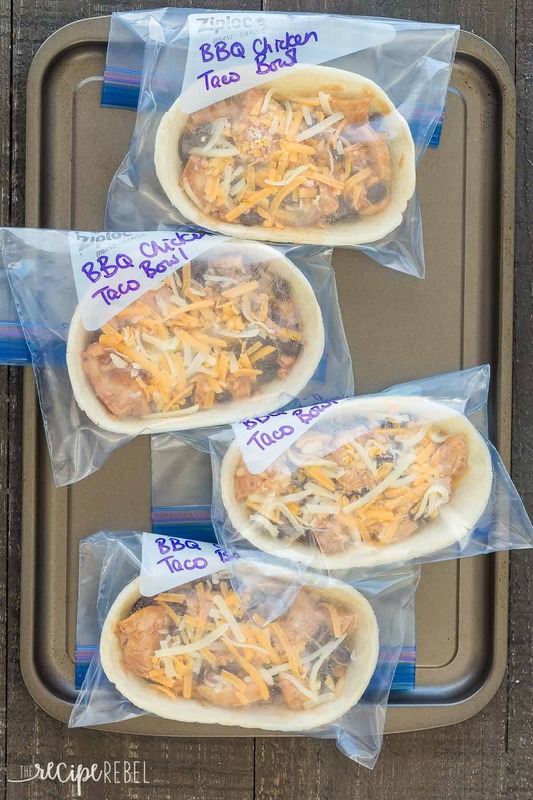 You can just line up your taco shells in a 9×13″ pan, stuff and bake (leave off the cold stuff! ), then everyone can grab their own and top as their hearts desire. We’ve done this for one of the girls’ birthday parties and I think it was one of my favourite party meals — it’s so simple and no hassle. Which is exactly what we’re going for these days! 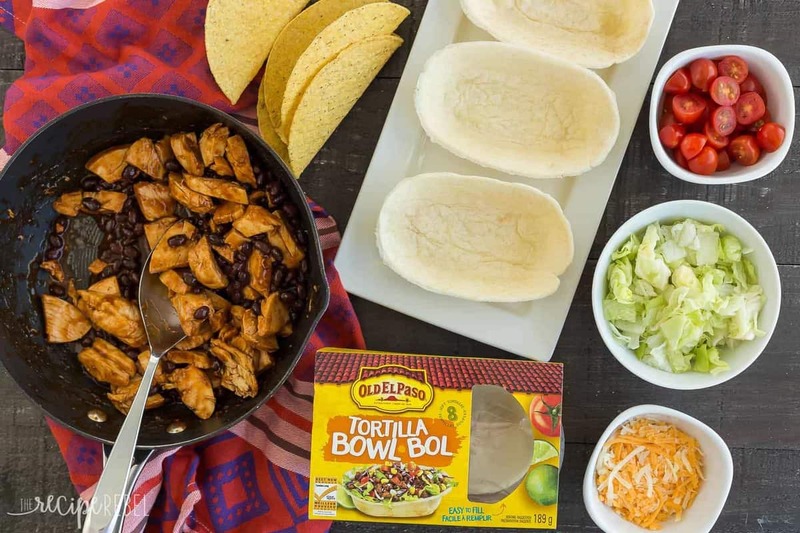 But our kids have a thing for these fun tortilla bowls from Old El Paso and I loved the idea of making, filling and freezing them individually wrapped for a no-stress meal on a busy night. I don’t recommend filling them if you’re going to store them in the refrigerator, but you can easily make the filling on the weekend and store that in the fridge for later on in the week. *This post is generously sponsored by Old El Paso as part of my brand ambassadorship with them! 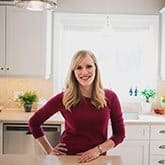 Thank you for supporting brands that help me bring you these easy, healthy recipes. 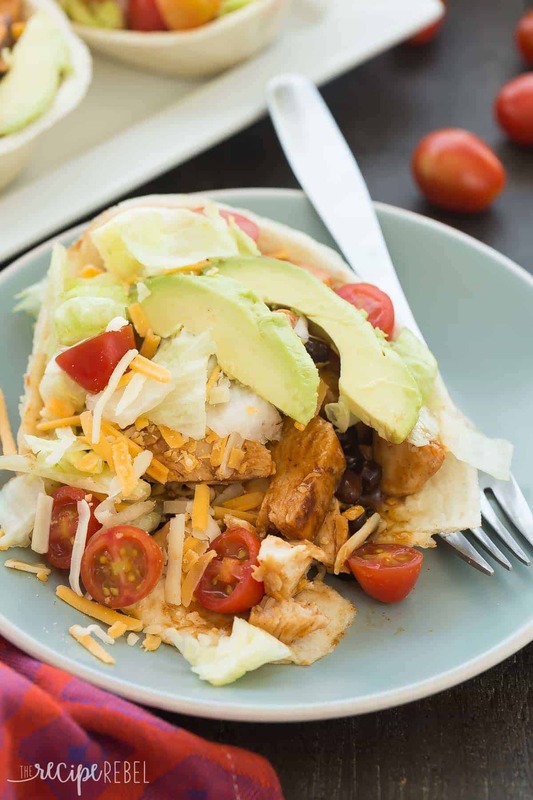 These BBQ Chicken Taco Bowls are an easy make ahead meal -- freezer friendly and perfect for your week's meal prep! The chicken can be made on the stovetop, in the slow cooker or Instant Pot. Includes step by step recipe video. In a medium skillet, stir together chicken broth and taco seasoning and bring to a simmer over medium heat. Add chicken breasts, cover and cook for 12-15 minutes, until cooked (165F internal temperature). Remove chicken and slice. Return to pan with the broth and add beans and barbecue sauce. Cook on medium heat for 5 minutes until heated through. 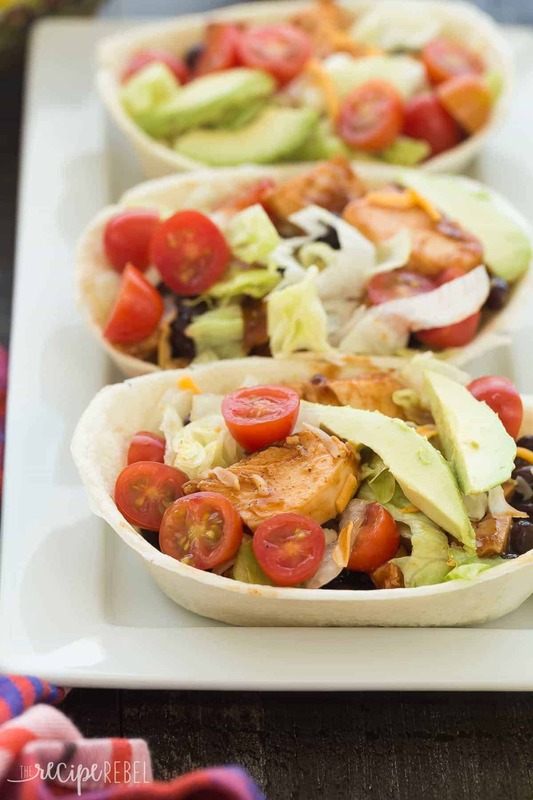 Fill tortilla bowls with ¼ filling each, and sprinkle with ¼ cheese, lettuce and tomatoes. Add additional toppings as desired. *TO MAKE AHEAD:Let filling cool completely. Divide filling between 4 bowls, sprinkle with cheese, and wrap each in tin foil or place in a medium freezer bag and freeze. To heat, unwrap, place on a parchment lined baking sheet and bake at 350 degrees for 22-26 minutes until heated through. The edges will get a little crispy, if you want to avoid this, cover with some foil. Garnish as desired. *INSTANT POT: To cook frozen chicken in the instant pot, combine ¾ cup broth and seasoning, pour into Instant Pot. Add 2 frozen chicken breasts, seal Instant Pot (pressurized, not venting). Turn on to Manual, high pressure for 15 minutes. Once timer beeps, do a quick release, slice chicken and toss with beans and barbecue sauce (put on sauté mode if you want to heat the beans through). *SLOW COOKER: Place chicken breasts in a 2-4 quart slow cooker, sprinkle with taco seasoning and pour over broth. Cover and cook until a temperature of 165F is reached, about 2-3 hours on low for thawed breasts. Slice, and stir in barbecue sauce and beans. Fill tortilla bowls with 1/4 filling each, and sprinkle with 1/4 cheese, lettuce and tomatoes. Add additional toppings as desired. Let filling cool completely. Divide filling between 4 bowls, sprinkle with cheese, and wrap each in tin foil or place in a medium freezer bag and freeze. To heat, unwrap, place on a parchment lined baking sheet and bake at 350 degrees for 22-26 minutes until heated through. The edges will get a little crispy, if you want to avoid this, cover with some foil. Garnish as desired. 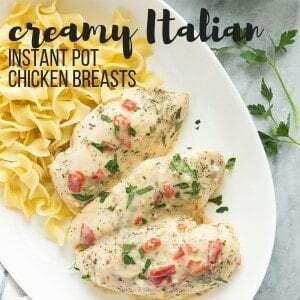 *INSTANT POT: To cook frozen chicken in the instant pot, combine 3/4 cup broth and seasoning, pour into Instant Pot. Add 2 frozen chicken breasts, seal Instant Pot (pressurized, not venting). Turn on to Manual, high pressure for 15 minutes. Once timer beeps, do a quick release, slice chicken and toss with beans and barbecue sauce (put on sauté mode if you want to heat the beans through). [br]*SLOW COOKER: Place chicken breasts in a 2-4 quart slow cooker, sprinkle with taco seasoning and pour over broth. Cover and cook until a temperature of 165F is reached, about 2-3 hours on low for thawed breasts. Slice, and stir in barbecue sauce and beans. [br]*Nutrition information is estimated and will vary depending on exact serving size, types and brands of products used. Is the insta giveaway only open to canada? Thanks! It is this time, yes! On instagram today? Fantastic – can’t wait! These bowls were GREAT! We tried them yesterday for the NASCAR race and LOVED them! Now just waiting for that contest to post! Oh I’m so glad to hear you liked them! Did you happen to see the giveaway? It went up yesterday afternoon! 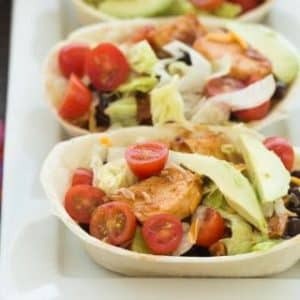 I need to start thinking of cinco de mayo and these taco bowls will be so perfect! Love that they can be prepped for lunch throughout the week too! Thanks Zainab! We loved them! How have I never tried those taco bowls before?? SO much more fun than regular tortillas or shells! My family would go CRAZY for these, Ashley! Love the idea of having these in the freezer waiting for me! I need to make them soon! Freezer meals are lifesavers! Thanks Jessica! Sounds great! Unfortunately I don’t do Instagram, bummer! Oops! I forgot about Cinco de Mayo!! I guess I still have time. I have never tried a taco bowl, but of course it would be awesome! Need to try this! Haha! I usually do, too but Old El Paso is helping me celebrate this year! You definitely need to try them! Yes! I keep forgetting about Cinco de Mayo! What a perfect recipe to be able to make ahead for that day. I love anything in taco bowls, especially when it’s filled with barbecue flavors. What a fun and delicious dish! Wishing this was my dinner tonight! Thanks Gayle! My kids are a little obsessed with the bowls — they’re a little bummed if we ever just have normal taco shells or tortillas! Lol.